A research team uses the example of the acacia to show how interaction between native and invasive species varies. Acacia longifolia, a species of acacia from the Fabacean family that is native to Australia, was initially cultivated in Portugal as a means of securing sand dunes and is now spreading uncontrollably - with varying impact on native species. Since the plant can use nitrogen from the air on account of its symbiotic relationship with bacteria on its roots, and since it also grows rapidly and produces a lot of biomass, it enriches the naturally nutrient-poor dune ecosystem with nitrogen, leading to an undesirable fertilization effect. In addition, it consumes more water than native species. The ecologists Prof. Dr. Christiane Werner, Christine Hellmann, and Dr. Jens Oldeland have developed a new approach published in the journal PLOS ONE for identifying the areas in which the acacia interacts with native species. The team determined that the invasive species has a negative effect on the development of some native species, while it has no effect on others and even causes several species to grow better. The interactions between plants and their living and non-living environment has a decisive impact on the structure and function of ecosystems. To determine the strength and the spatial zone of influence of such interactions, the research team uses stable isotopes - heavy, non-radioactive forms of elements. The frequency with which these isotopes occur in materials in comparison to the much more common light isotopes can vary over space. The ratio of stable isotopes can therefore provide information on where and how a material originated. So-called "isoscapes," a portmanteau of "isotope" and "landscape," represent in map form how isotopes are distributed in a landscape. The team used isoscapes based on the leaf material of native species to show where the proportion of nitrogen fixed by the acacia is high and where the invasive species influences the growth of other species - whether positively due to additional nitrogen or negatively due to competition for water. A dwarf shrub from the Ericaceae family, for example, exhibits greatly increased nitrogen concentrations and more efficient photosynthesis in a large radius surrounding acacia, while a stone pine uses only very small amounts of the additional nitrogen. A dwarf shrub from the Fabacean family, on the other hand, which can also use fixed atmospheric nitrogen, is not influenced by the acacia at all. 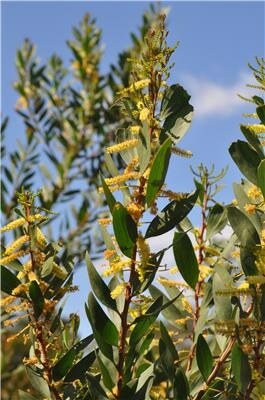 The results indicate that the interaction between the acacia and native plants is species-specific. In addition, the influence varies depending on the amount of nitrogen or water available to the species. In order to use this information to make a map integrating these various aspects, the scientists conducted a cluster analysis. This statistical method finds subgroups in the sampled area that exhibit a similar combination of the measured values, allowing them to be interpreted as zones of influence. The goal of these analyses is to better describe, elucidate, and understand the complex relationships and dynamics governing natural ecosystems. Christiane Werner is a professor of ecosystem physiology at the University of Freiburg's Faculty of Environment and Natural Resources. Her doctoral student Christine Hellmann conducts her research at the University of Bielefeld, and Jens Oldeland is a research assistant at the University of Hamburg.